This event has now come and gone but the guest speakers were videoed, and everyone who has signed up to the email list for www.naturalmedicine.net.nz will be sent a link to the footage when it has been posted online. For the new Resource and Events directory, please visit http://natural-medicine.directory/. 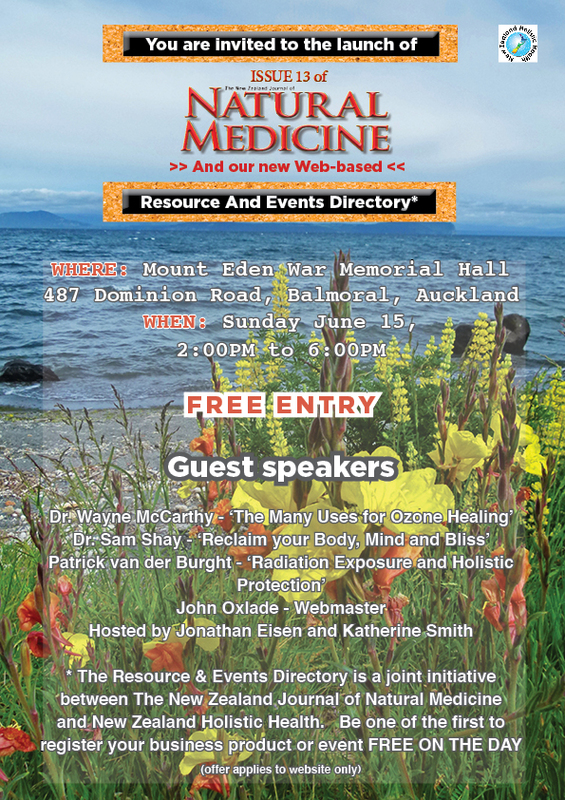 The New Zealand Journal of Natural Medicine would like to invite readers and friends to attend a special event on June 15, 2014. The event will officially launch issue 13 of the Journal as well as introduce The New Zealand Journal of Natural Medicine Resource and Events Directory. Developed in association with New Zealand Holistic Health which currently runs a very popular Facebook page, the site will be live by the date of the launch and will be introduced by webmaster John Oxlade. The event will feature presentations by chiropractor Dr Sam Shay, Patrick van der Burght from Geovital Academy for Radiation Protection and Healthier Living and Dr Wayne McCarthy.